Welcome to Wonder Trade. 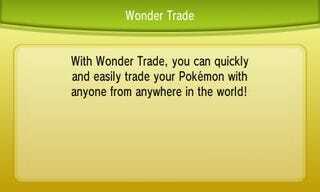 This mechanic was introduced in Pokémon X/Y and, as you can see by the header image, is a "quick and easy way" to trade your pokémon with random people across the world! It returns in Omega Ruby/Alpha Sapphire, and it's here in Omega Ruby that I put it to the test. After an evening of hunting for fossils and endless repetition of talking to the same NPC repeatedly, I had twenty fossil pokémon to hand out on Wonder Trade and see what great things I would end up with! But it still wasn't really that good. Everything I handed out was level 20 with decent stats and they were something that you can't get right away outside the first city. Out of twenty trades I got three new dex entries and four pokémon that would actually be worth raising. Eight were monsters that can be caught within the first couple hours of playing. To say the least, I think I got the short end of the stick this time. Four people made off with Aerodactyl for junk. To be honest, it makes me a little sad. What do I think could make Wonder Trade a bit better? If it could have the restriction of nothing under level 20, it would remove the odds of getting Wurmple and Bidoof and other outside the first city monsters. Unfortunately, this would also mean no more level 1 egg overflows, the "not quite perfect" 'mons that people are breeding and giving away out of some form of kindness (I myself handed off a box full of Froakie like this back in Y). Or maybe if more people were like the ones that sent off Tropius or Loudred. These were mid-level range monsters that are caught later on in the game. Or the person who sent the Charmander. Starter 'mons are always appreciated, even if they are castaways. I could be over reacting, twenty trades isn't a huge sample size but I'm sure a reasonable sample would require emptying all my boxes for pretty much nothing in return. Has anyone had any good luck with Wonder Trade? Any shiny monsters (whether they were legit or not...)? Any great trades where you got something completely unexpected? And, lastly, if you're anyone who got a fossil pokémon tonight and traded a Wurmple for it, you've just made my enemy list. TAY Open Forum: Bueller... Bueller...?